"We're a couple of days away from victory," Hugin told the crowed gathered at Saturday's rally. "The people of New Jersey deserve better because this guy has embarrassed us. Twenty-five years, and he's failed us ethically and failed the people of New Jersey." "I am a leader and have been one my whole life," said Hugin. He told the crowd, "it will be about getting the vote out." "Thank you for what you've done to get us here. Let's get this ball over the goal line. We're at the five-yard line, we're going to push it over," Hugin said, and the crowd cheered. 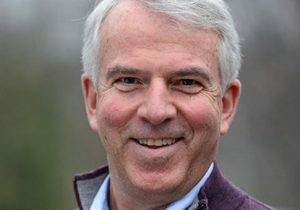 Hugin's message that voters deserve better than Menendez has been consistent and hammered home on the campaign trail, in TV advertisements, and on social media. The message has resonated with voters at the rally who were interviewed by the Free Beacon. Frank Goodline of Colts Neck, said he came to hear Hugin speak and is "really hopeful" he will represent New Jersey in D.C. "I like his demeanor. I'm resentful that the Democratic senators don't represent my values. Menendez and Booker do not represent most New Jerseyans," he said. Tamara Wooley of West Long Branch, a member of the Monmouth County Republican Club, said she plans on working through Election Day to "try to get out the vote." "I'm very hopeful, I think we have the momentum," said Wooley. "Senator Menendez has really failed the citizens of the state and we're very fortunate to have someone of the caliber of Bob Hugin." For the race to be this close in a blue state, Wooley said, is exciting. "We're within striking distance and hope to get him across the finish line, we hope to get him to D.C.," said Wooley. One couple at the rally were taking Bob Hugin signs and planned on working diligently to get Hugin elected. Dalila Malave of Howell said she and her husband believed Hugin would represent them better than Menendez. "Hugin is a great man. We trust him that he will do the right thing," said Malave. "We need an honorable person to represent us. We're tired of Menendez's corruption. He got away with it even though he was guilty." The race between the ex-CEO of Celgene and former Marine and Menendez has narrowed considerably from a comfortable lead for Menendez to a "toss up" by the nonpartisan Cook Political Report a week before voters cast their ballot. A judge declared a mistrial after jurors were deadlocked on 18 corruption charges against Menendez brought by the U.S. Department of Justice. The Senate Ethics Committee "severely admonished" Menendez this past April and ordered him to repay for the lavish gifts he accepted from Florida eye doctor Salomon Melgen, a donor to Menendez's campaign. Melgen was sentenced to 17 years for Medicare fraud.